Colorado native Vinnie Montez -- who bills himself as “the large, loud Latino comedian” -- performs his comedy act at the University of Wyoming Friday, Dec. 5, at 9 p.m. in the lower level of the Wyoming Union. The event is free and open to the public. Montez’s parents and his Mexican heritage had a large influence on his life while growing up. He was taught traditional values and also was given the freedom to be himself. 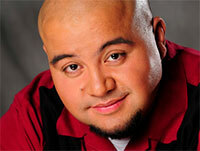 Montez is an energetic performer who uses physical comedy as a major device in his act. His hilarious style of comedy has given him the opportunity to perform nationwide alongside many other comedians, including Paul Rodriguez and Chris D’Elia. He is continuing his work with the Comedy Crew stand-up comedy act. To learn more about the group, visit www.vinniescomedycrew.com. For more information about Montez, visit his website at www.vinniemontez.com. Also, Friday evening, the UW Residence Hall Association and Friday Night Fever sponsor the film “The Boxtrolls” at 6:30, 9 and 11:30 p.m. in the Shoshone Room in the basement of Washakie Dining Hall. Adapted from the children’s book “Here Be Monsters” by Alan Snow, “The Boxtrolls” focuses on a young orphaned boy named Eggs. Eggs lives underground with a community of trash-collecting creatures called Boxtrolls. Friday Night Fever is seeking UW student volunteers to assist with programs. If interested, contact FNF@uwyo.edu or stop by weekly meetings each Thursday at 5:30 p.m. in the Campus Activities Center, located in Wyoming Union Room 012. For more information about Friday Night Fever events, visit www.uwyo.edu/fnf, like the Wyoming Union on Facebook or follow on Twitter @UWYOCAC. To receive information about upcoming Friday Night Fever events, text ‘UWYOCAC’ to 71441.